SeaFall is the third Legacy game designed by Rob Daviau. It was preceded by Risk: Legacy and Pandemic: Legacy Season 1. Both were important and acclaimed games whose innovation and scope sent ripples through the board game community. Now, for the first time ever Rob has built a world and game from scratch around the Legacy idea. SeaFall was absolutely and unequivocally my most anticipated game since first teased by Rob Daviau some four years ago. Skip forward to this past Friday and our campaign came to a abrupt close on its fourteenth game. For those of you unaware of SeaFall then let me sum that up as briskly as I can. Set during the age of sail it follows you as you nurture your province of bumbling merchants as they venture out into uncharted waters, happening upon mysterious islands and high adventure slowly uncovering the mystery of the lost civilisations that came before you. Paired with the legacy system that actively encourages stickering boards, ripping up cards and writing on things it’s a heady mix and an idea ripe with exciting possibilities. And upon first encountering the contents of this voluminous box you’d be pretty optimistic that the journey you are about to take would be exactly that. Which makes the fact that while SeaFall does indeed contain all of these things it’s a crushing disappointment to discover that it never manages to truly capitalise on any of them. The one area that the game does deliver is the abundance of the Legacy experience. 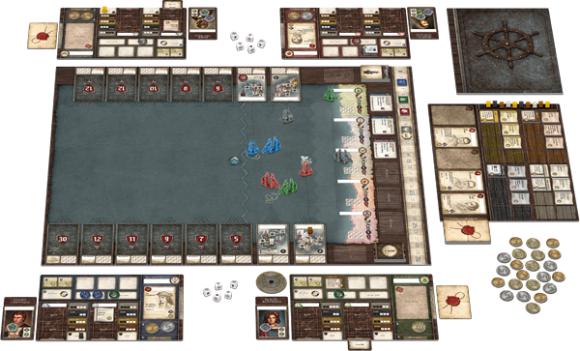 As with Risk and Pandemic, SeaFall has those marvellous boxes each a tantalising prospect of new and exciting developments however its in how it chooses to utilise them that differs from its illustrious predecessors. Whereas in Pandemic each box felt like a thunderclap of new content SeaFall’s legacy moments permeate into the status quo loading each turn and decision with the possibility of changing the game state in some way. This method of delivery is both a blessing and a boon for as the campaign progresses and each new box smears its goodness over the existing game like so much crunchy peanut butter the contents of the subsequent boxes starts to resemble Schrodinger’s moggy. That initial elation of unlocking all this new stuff is tainted by the faint whiff of recently expired feline. SeaFall teases us constantly but it so often feels like you’re stealing glances at some sprawling epic adventure from the window of a passing train. You’re convinced it’s preparing the foundations with which to deliver a grand operatic tale of redemption and jaw-dropping reveals replete with heart-stopping cliffhangers up until the point it doesn’t. The choice of the Captains Booke to deliver the story inherently created many issues, with no way to unravel the tight plot that Pandemic so successfully utilised story threads and plots are peppered throughout like a schizophrenic producing a cover version of David Lynch’s greatest hits. Rob has said that originally he’d thrown everything into the design but that it run away from him, and a year into the process the only sensible option was to stop and rebuild stripping away the extravagant and narrowing the scope in the hope of it ever being finished. It’s during this process I believe that the heart of SeaFall was cut out and the resultant finished design presents us through necessity a compromised version of Rob’s original bigger idea. There’s still fossils from this larger beast to be excavated from what finally was SeaFall but so much of it feels incomplete or abbreviated. The game’s final unwelcome capstone is in its choice of how to end. On the board teasing you throughout proceedings is an undiscovered location that requires a significant effort to uncover and will open the last legacy box. It’s by design there teasing and building anticipation every single time you play. You’ve been pre-programmed to want to open that box to discover its secrets, finding the last continent was supposed to be the end of the game, but then why the box? What was going to happen? Well the game would end is what, and while within is a hastily bolted on epilogue as if Michael Bay had suddenly been prodded and told to sort this mess out mostly it was the stale air of dissatisfaction. For me, this started so well, I was willing to look beyond some of its shortcomings. Many bemoaned the actual game wasn’t all that great, and now, here at the end of this world looking back on all we have accomplished I find it hard to be the apologist. That’s not to say that we didn’t enjoy the journey even accepting the ho-hum pickup and delivery mechanisms and the frustratingly random turn sabotaging events. We even mostly forgave the infuriating sudden end game developments of the milestones that could see an entire games preparation dashed by another player suddenly ending the game. It’s just now, with the knowledge that so much of what you invested time in completing really wasn’t worth the effort, so often you could have just as easily taken a shortcut to accomplish the same result. It’s a growing sense of disappointment that all the really cool stuff that could have happened all the things you were breathlessly anticipating were never there, to begin with. At the end of the day is just a game and for what it’s worth for a majority of it I did enjoy myself. But all of that goodwill, all of those hours poured into this sours when you finally have to shrug and acknowledge it’s really not all that good of one. 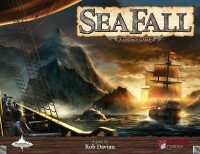 Add a Review for "SeaFall"